The idea that it was wrong to meat in the Middle Ages was certainly not widely held. Most people would consume meat from cattle, sheep and other animals without any vexation. 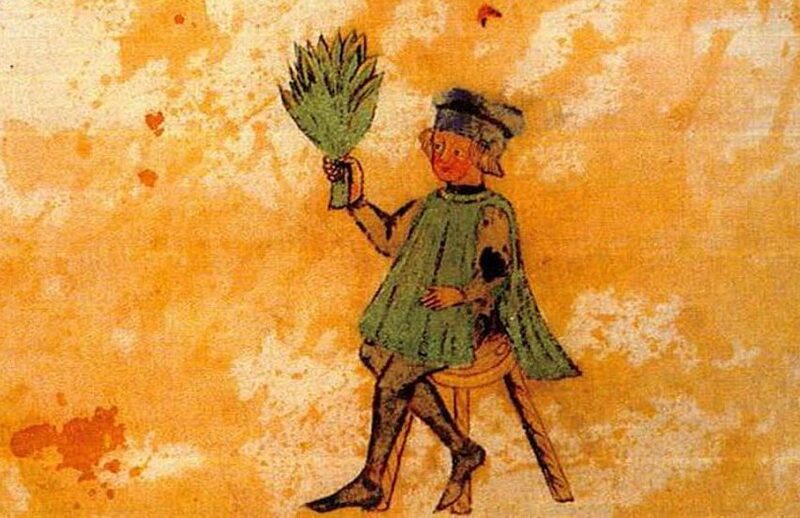 However, one well-known 11th century poet was not only a vegetarian, but also a practicing vegan. One of the most fascinating figures in the medieval Middle East was Abul ʿAla Al-Maʿarri (973–1058), a poet and philosopher. Born in northern Syria, he would lose his eyesight at the age of four after falling ill to small-pox. This did not deter Al-Maʿarri, as he would become an excellent student, and by the age of twelve had started his career as a poet. His fame grew, and in the early eleventh-century he travelled from Syria to Baghdad, where he was treated like a celebrity. However, when he heard his mother was dying he returned to his hometown of Maʿarra, and remained there for the rest of his life. Al-Maʿarri would continue his teaching and writing from there, and kept in regular contact with other scholars from around the Arab world. We have one set of correspondence – a series of five letters between Al-Maʿarri and an Egyptian named Hibat Allah Ibn Musa, where we learn more about why the former observed a very strict diet – refraining from not just only meat, but any food created from animals. While there were other cases where medieval people, including some saints, did not eat meat, their reasons were based on living a more ascetic lifestyle. Al-Maʿarri, on the other hand, had very different reasons for his choice of diet. What is your ground for abstaining from meat, milk, and all other animal products, as though they were unlawful? Are not, I ask you, plants set by nature where the animals will come upon them, so that by their existence, their goodness, and by a sensitive force which the animals possess the latter have power to utilize the plants? Were it not for the animals, the plants would be a meaningless and purposeless creation. On the same principle the human force controls the animals just as the animals control the plants, owing to the superiority which man possesses in the reason and the power of speech. Hence man utilizes the animals for a variety of purposes, and were it not for that, the creation of the animals would be purposeless. Hence your refusing to use what is created for you, and ordained on your account, destroys the harmony of Nature. …the Prophets tell us that Almighty God is merciful and loving. If, then, He be loving towards mankind, assuredly He will be tender to other classes of living beings which are sensitive to the least pain. Now it is well known that when the calf is killed the cow pines for it, and keeps awake the whole nights on its account. Its flesh is eaten, and the milk that it should have sucked is lavished on its mother’s owners. What harm, then, can there be in abstaining from killing the calf, and declining to use the milk? Such a man need not supposed it to be unlawful, he only abstains out of religious fervour and mercy towards the victim, and in the hope that he may be compensated for his abstinence by the Creator’s forgiveness. And if it be said that the Almighty distributes His gifts equally between His servants, then what sins have the victims committed that they should be excluded from His mercy? Since the bees fight their hardest to keep the gatherer off their honey, there is no harm in a man abstaining from it, and desiring to place the bee in the same category as other creatures that dislike being killed to be eaten and having their means of living taken to feed and fatten women and other human beings. Another ground that induced me to abstain from animal food is the fact that my income is a little over twenty dinars a year, and when my servant takes out of that as much as he wants, no magnificent sum is left. So I restrict myself to beans and lentils, and such food as I would rather not mention. So now, if my attendants gets what I think much and he thinks little, my portion is a small fixed charge. And I have no intention of increasing my rations, or getting fresh visits from ailments. you give me an answer of which I can only say, “Are these the utterances of sound wits?” This medicine of yours only makes the sick man yet worse, and your words only increase the blindness and deafness of him who is religiously and intellectually suffering from those ailments. With regard to your assertion that meat cannot be procured without infliction of pain on animals, that has already been answered. You need not be kinder to them than their Creator. Either He is just or unjust: if He is just, then He takes the lives of eater and eaten alike, and His right is unquestioned therein; if He be unjust, then we need not outdo our Creator and be just where He is unjust. If this principle were applied, a man not to pray except the appointed prayers, for any additional prayers lead to unnecessary trouble, which God does not approve. Also when a wealthy man has set apart the fortieth of his gold for alms, he ought not to give any more; whereas there are many places in the Quran in which expenditure is commended. I have no desire for any increase; no desire to return to delicacies, abstinence from which has become a second nature to me. For forty-five years I have tasted no meat, and an old man does not quit his habits till he is covered by the grave-dust. The full text and translation of the letters between Ibn Musa and Al-Maʿarri can be found in the article, ‘Abu ‘l-ʿAla al-Maʿarri’s correspondence on vegetarianism,’ by D. S. Margoliouth, which was published in the Journal of the Royal Asiatic Society in 1902.